The center of Powerful Hurricane Dean is now just 70 miles away from Kingston, Jamaica. Hurricane-force winds are now likely in full gear especially across the southeastern portion of the island nation. Waves are battering the southern and eastern shore and torrential rains have begun. According to the US National Hurricane Center, Hurricane Dean is packing sustained winds of up to 240 kilometers (150 miles) per hour, placing the hurricane a notch below category five, the most severe level. “Preparations here are very similar to preparations for war,” Alon Gildoni told Ynetnews. “We are gathering a lot of water, canned food, and candles, and we are entrenching ourselves in our homes,” he added. 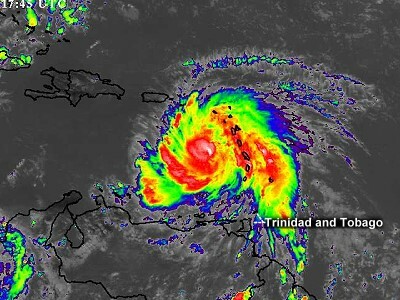 Jamaica declared a curfew and troops and police patrolled the streets Sunday as Hurricane Dean bore down on the island as a ferociously powerful storm, having already killed five on its path through the Caribbean. Residents huddled in their homes today as rain poured on the island, the beginning of what forecasters predicted could turn into gale force winds, mudslides and heavy damage. The time for escape has passed as Jamaican authorities shuttered the airports Saturday night. The police ordered businesses closed in an attempt to avoid the looting that followed Hurricane Ivan in 2004. 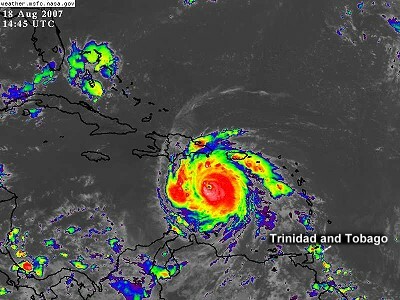 In light of the forecast that Hurricane Dean will directly pass over Jamaica, the Ministry of Foreign Affairs, through its High Commission in Kingston, has been in contact with Trinidad and Tobago students on the island, a release yesterday stated. DUE to the disruption caused by Hurricane Dean, Caribbean Airlines will not operate its scheduled service from Antigua to Kingston and Kingston to Antigua today. 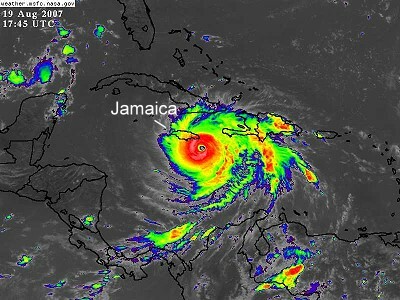 Hurricane Dean, a category 4 storm that is the first of the season, on Sunday afternoon reached Jamaica as it travelled through the Caribbean on a path set for Mexico’s Yucatan peninsula. 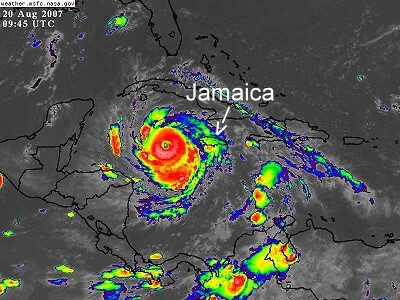 “The first effects are being registered,” a member of the Jamaican disaster-response services was reported as saying. Wind speeds were reported to have picked up significantly in western parts of the island and heavy rainfall was recorded. 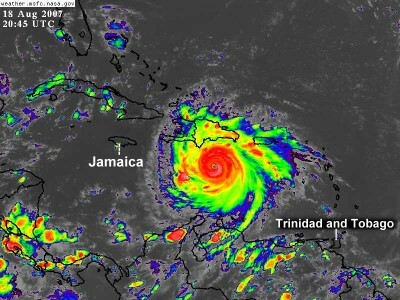 DEADLY AND dangerous Hurricane Dean has Jamaica in its firing line and predictions from the National Hurricane Center in Miami, Florida, are that the storm will hit Jamaica later this evening. Hurricane Dean streaked toward Jamaica and the Yucatan Peninsula on Saturday, and President Bush issued a disaster declaration for Texas days ahead of its final landfall, most recently projected for northern Mexico. Hurricane Dean churned across the Caribbean yesterday, heading directly for the dirt-poor island of Hispaniola, Jamaica and Mexico’s Yucatan Peninsula. 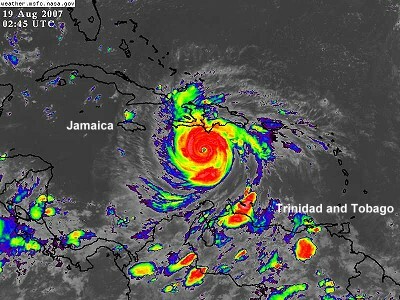 Hurricane Dean, the first of what is forecast to be a busy 2007 Atlantic hurricane season, has already hammered the eastern Caribbean, killing three and flattening banana plantations. Thousands of Britons on holiday or visiting relatives were among those trying to leave Jamaica before airports closed. SANTO DOMINGO, Dominican Republic — Alarmed tourists jammed Caribbean airports for flights out of Hurricane Dean’s path Saturday as the monster storm began sweeping past the Dominican Republic and Haiti and threatened to engulf Jamaica and the Cayman Islands. 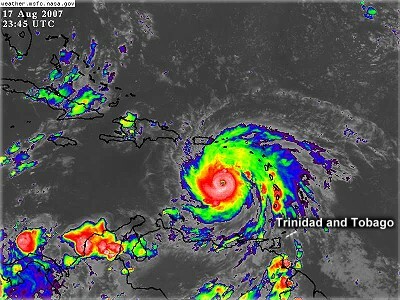 Hurricane Dean, expected to increase in intensity, roared past Puerto Rico, plowing its way west through the Caribbean Sea toward the Dominican Republic, Haiti and Jamaica. Houston, Aug. 18 (AP): The astronauts aboard the shuttle Endeavour and the international space station prepared Saturday for the last spacewalk of their joint mission, an outing that was scaled back because of approaching Hurricane Dean. NASA shortened the spacewalk by two hours to bring Endeavour back to Earth on Tuesday, a day early, just in case the storm veered toward the Houston home of Mission Control. Thanks for the Excelent reporting 0n various subjects, It breaks my heart to see and read about the suffering caused by the hurricane. One can only imargine what it was like for thoes people who was in it’s parth. I hope and pray that it dies before it causes any more destruction. I HOPE THAT THIS DOES NOT CAUSE ANY MORE DAMAGES TO OUR SWEET SWEET T N’T. ONE LOVE TO ALL MY TRINI’S.